Mix together the graham cracker crumbs and sugars in a medium bowl. With a spoon, stir in the melted butter. Pour the crust mixture in a 9-inch pie pan and firmly pack into a crust with a measuring spoon (and/or your hands). Bake for 7-8 minutes, then cool over a wired rack. In a medium saucepan, whisk together the sugar, cornstarch, salt, and matcha powder. Add the egg yolks, heavy cream, and milk. Heat the filling over medium heat, and bring to a simmer. Whisk constantly, and simmer until thick, about 5-7 minutes. Strain the mixture through a sieve over a bowl to remove any lumps. Stir in the butter and vanilla extract. Pour the filling in the baked pie crust. Place plastic wrap directly on the filling and chill in the refrigerator for at least four hours. With an electric mixer, whip the heavy cream and granulated sugar over medium speed until the cream reaches stiff peaks, about 4-6 minutes. Take the pie out the refrigerator and slowly remove the plastic wrap. Place the banana slices over the pie. 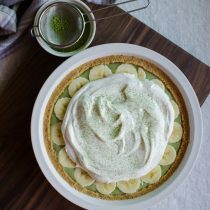 Spread the whipped cream over the pie, then sprinkle matcha powdered on top. Keep chilled in the refrigerator until you're ready to serve.